Chris Cutting teamed up with two members of the Eastbourne support group on Wednesday 27 September 2017 to attend an open afternoon in the Urology Department at Eastbourne District General Hospital. It was for members of the public wishing to learn more about clinical investigations and treatment procedures carried out in the department. Chris set up a display table with PCaSO information and was on hand together with Jon and Jane Chapman to talk to visitors. They were warmly welcomed by the staff that popped in to say hello between taking visitors around their workplace. Ten to 15 people were keen to learn about the work of the support group which has just clocked up 15 years since its first meeting in 2002. 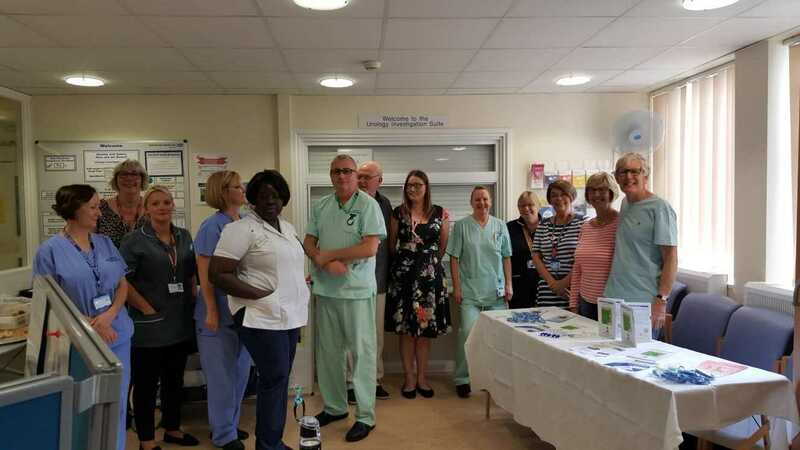 It has strong links with the department and over the years has raised funds for equipment and facilities that benefit prostate cancer patients. In addition, the group has also held a number of awareness events in the local area about this male cancer. See our fundraising and awareness pages for further information.